The debut of Star Wars: Rebels signified several things. It was the first major animation work by the team behind The Clone Wars after the purchase of Lucasfilm by Disney, and perhaps in an effort to differentiate the two series, it was set decades ahead of that show and only a few years before A New Hope. The reason for this may have been a growing interest in refocusing the public’s attention on Star Wars toward the Original Trilogy and away from the troubled Prequel Trilogy. Specifically, the fact that the next Star Wars film to be released in theaters, Rogue One, takes place a sliver of time before A New Hope indicates that might be a major reason for the chronological setting for Rebels. Another reason, however, is that with the debut of the show, placed as it was, major characters of the Original Trilogy would be alive and approximately the same age as they appeared in that trilogy. This drives interest in those characters and thus, interest in all the future expanded universe material released and yet to be released. Since Rebels’ debut in 2014, a season and a half have come to pass. In that time period, we have seen R2-D2, C-3PO, Lando Calrissian, Grand Moff Tarkin, and Darth Vader. Each have had varying amounts of screen time and each have also carried a particularly heavy burden on the show’s writers and animators. For characters who are original to the show, such as Ezra Bridger or Hera Syndulla, who have no real world counter parts, they are exactly as they are created. For viewers, everything they say, every way they say it, and how they move, it’s original. With the Original Trilogy characters above, a larger task is at hand. When animating Lando Calrissian, not only must they decided on his appearance, on how to perfectly take the man physically embodied by Billy Dee Williams and render him into an animated figure, but they must also watch his movements in The Empire Strikes Back and Return of the Jedi. Beyond simply making sure the script for Williams (who returned to voice the role) sounds like Lando, they must convince legions of fans who have become intimate with all the physical mannerisms that this is the same character and not just a Lando-knock off so to speak. A final difficulty that must be overcome by the creators is how to incorporate these characters into the story. The struggle is only as problematic as the degree of care which the creators want to adopt, and in a show like Rebels, which has repeatedly shown that a lot of attention is given to caring, it is no simple solution to simply throw the character into the frame. Appearances and roles for the characters must make sense given the time, setting, and ongoing storyline. Rebels has deftly adopted something of a loose serial approach, with every episode strung along after another, events in one spring boarding the characters into events in the next. It simply isn’t a true series of stand alone episodes where one can configure the plot without considering the past events. Thus, when major characters have appeared on Rebels, their presence almost always makes complete sense concerning everything else that has happened up to that point. Princess Leia’s first appearance in “A Princess on Lothal” is no different. Our episode opens not long after the conclusion of “Legacy,” in which the former governor of Lothal, Ryder Azadi, had informed Ezra that his parents were dead, killed in an escape attempt from Imperial prison. For all the stoic acceptance that Ezra displayed upon learning this information, we quickly learn that the Jedi in training has been strongly affected by their deaths. The news then that a mission from Alderaan with resupplies for the rebels following the attack on their past base is welcomed by Kanan who believes it might perk up Ezra. At which point, we cut to space and three ‘hammerhead’ style transports approaching Lothal. In charge of the ships is Leia Organa. Kanan and Ezra, disguised as a storm trooper and Imperial cadet respectively, arrive at the landing location of the transports, where Leia’s original plan to simply allow the Rebels to steal the ships goes awry when the local Imperial officer anchors them with gravity locks and places AT-AT walkers around the perimeter to keep what Leia has described as “supplies for the people of Lothal,” safe and sound. It’s a call back to Vader’s dismissively described “mercy missions” in A New Hope. In a bid to find the time to figure out a new plan, Leia commandeers the officer’s shuttle and takes off with Ezra and Kanan in tow. Ezra’s reaction to Leia is almost akin to a POV character for us, the viewers. 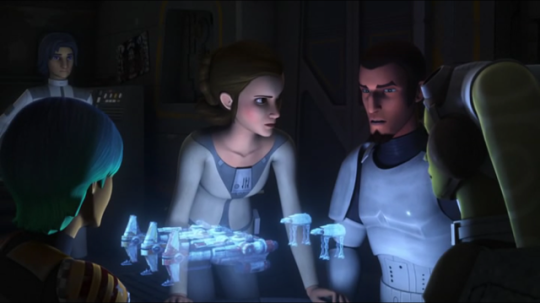 He’s unsure if she belongs there and doubts if she has the ability to do the job, mirroring, perhaps, our own apprehension of whether the creators behind Rebels were right and able to introduce the princess to the show. They return to the hiding spot of former governor Azadi only to discover that he’s been located and placed under the arrest of a squad of troopers. Thankfully, the Ghost arrives and stages a rescue of Azadi with a mock kidnapping of Princess Leia tossed in to boot. The scenes which follow are designed to highlight Leia’s natural abilities as a leader, be it to console a fellow rebel or to inspire others into action. In the former, she finds Ezra gazing sadly at an image of his parents. 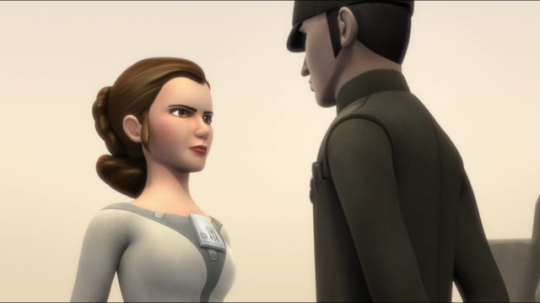 In the Leia equivalent of a motivational speech, she encourages Ezra to focus on what his parents would want him to do, namely, not to give up on hope and keep fighting the fight. It works. This leads to the next scene as everyone stands around a console trying to figure out how to steal the ships from underneath the Empire’s watch. Once again, Leia steps forward and while not providing a plan, inspires everyone around her to do suggest solutions to the problem. This includes Azadi, who had previously in the episode espoused an intent to stay out of the fight. The plan is relatively simple. Azadi, who built gravity locks as a prisoner, knows how to disable them, and volunteers to do just that, while under the cover of the other rebels. One by one, the ships would be freed and flown away before the Empire can react. On paper it sounds solid enough, but as we soon see, the plan quickly begins to unravel after the first transport is freed. This leads to a fire fight. 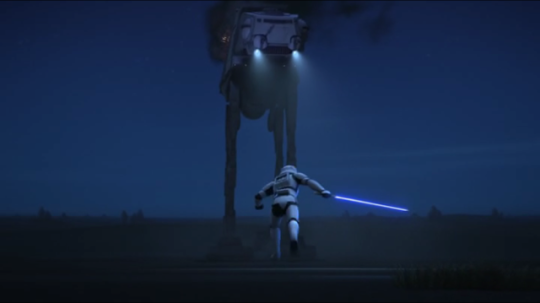 After torpedoes from the Ghost fail to knock out an AT-AT, Kanan reveals himself a bit more adept than Luke Skywalker, by slicing through the legs of the armored transports with his lightsaber and brings one down. Ezra, who we must remember should be only a few years removed from Leia, attempts to show off his own Force powers and disarms Stormtroopers. This ends up putting a blaster in Leia’s hands, which she uses effectively without hesitation. 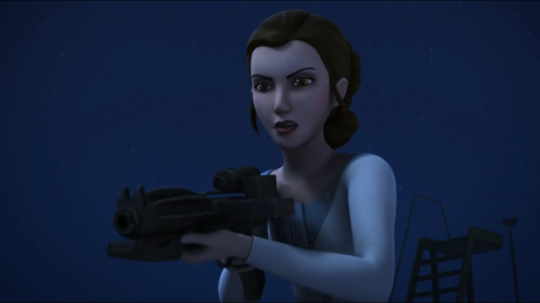 Apparently, Bail Organa did not forget to have his adopted daughter take lessons in firearms. Ultimately, the rebels succeed with the capture of the three ships and Leia orders Ezra to stun her to keep up the appearance of her neutrality. 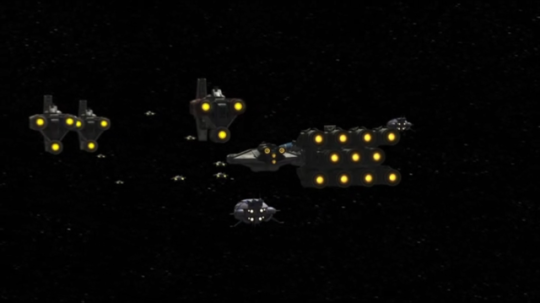 Before the episode cuts to a close, we are treated to a glance of the new rebel fleet, seeming even larger than before. Without a doubt, it was a purposeful shot to show the growing size of the rebellion, reflective of the fleet shots in The Empire Strikes Back and Return of the Jedi. In terms of Leia’s presence and role in “A Princess on Lothal” (which may or may not be a play on Edgar Rice Burrough’s A Princess on Mars), it can be said it was successfully done. Our future general of the Resistance displayed the qualities which would make her a fearless leader and fighter, be it inspiring others or being quite capable of picking up a blaster and rushing into the fray. One nice touch is her height, which is about accurate for Carrie Fisher’s own diminutive stature. Additionally, her presence simply makes sense given the role she and Alderaan played in the rebellion leading up to A New Hope. As Rebels episodes go, “A Princess on Lothal” was a good one, though one might have wished with Leia’s presence, it should have been one of the best of the second season.